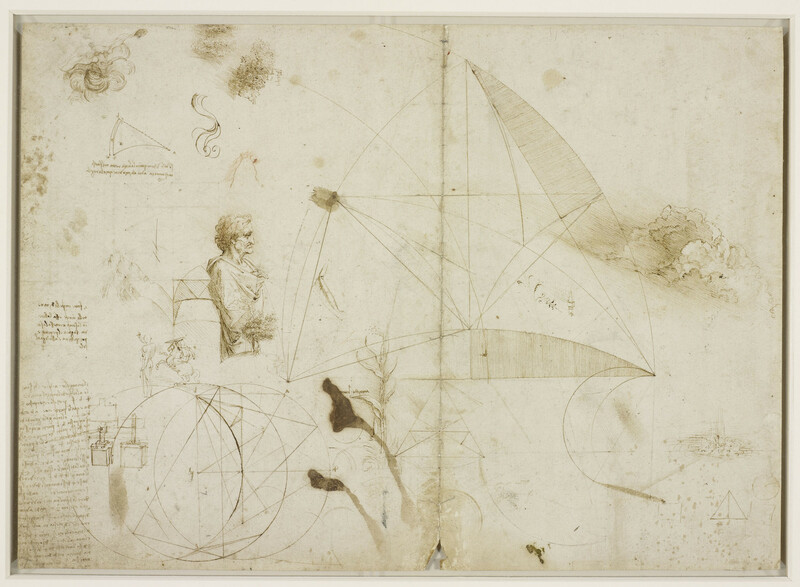 Recto: a sheet of studies mainly of geometrical figures, with notes on the diagrams. At top left, the leaves of an arum lily amid grass; at centre left, a half length figure of an old man, clean shaven with wavy hair, in profile right wearing a classical robe; immediately below him, two small trees, one bare of leaves; to the left, two sketches of soldiers, one on a rearing horse in profile left, the other standing with a shield, turned away three-quarters left; below, two sketches of a press; at lower centre, two stems of a grass; at upper left and to the right, several studies of clouds; various other slight sketches. Verso: geometrical drawings and related notes.